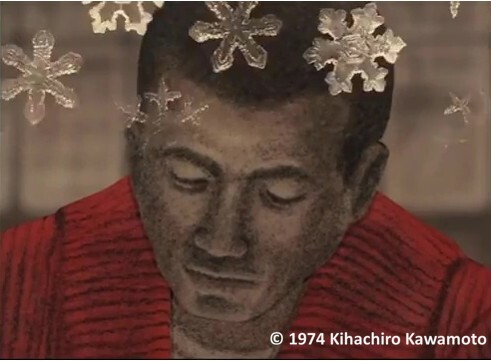 A Poet’s Life (詩人の生涯/ Shijin no Shōgai, 1974) is the only non-puppet animation of Kihachirō Kawamoto to win the Noburo Ofuji Award. Apart from his Self Portrait (1988), Kawamoto’s adaptation of modern tales tended to be done using cut-outs or drawn animation styles such as Farce Anthropo-cynique (1970) based on the short story by experimental modernist Riichi Yokomitsu (横光 利一, 1898-1947) or Kawamoto’s original screenplay Travel (旅 / Tabi, 1973). In interviews, Kawamoto usually explained that he was a firm believer in finding the right animation materials for telling the story. This animated short is an adaptation of a story of the same name by the great modernist writer Kōbō Abe (安部 公房, 1924-1993), who is known for his surreal stories that explore the modern angst of individuals in society. 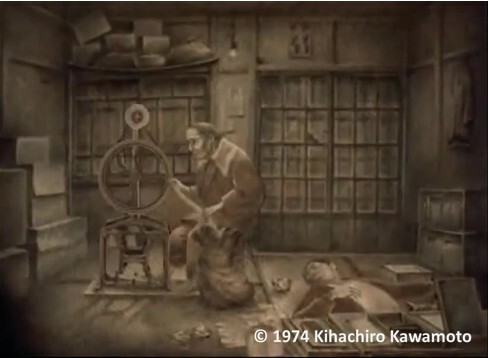 Unlike the colourful world of Kawamoto’s puppet films, A Poet’s Life is drawn in morose shades of grey and brown. The flatness of the cut-out aesthetic mirrors the one-dimensionality of the dreary life of the factory workers in this modern tale of inequality. The male main protagonist loses his job when he dares to complain to his boss about the terrible conditions that he and his fellow factory must endure. The man lies passed out on the floor of his home while his aged mother works diligently away on her squeaky spinning wheel. The dialogue is related through the use of title cards, and we learn that the old woman feels as worn out and limp as a thread of cotton. The cotton flies from her hands and as she reaches for it, she finds herself being terrifyingly turned into thread as well. The son awakes to find his mother has disappeared. All that remains of her is the clothes that were on her back, but he is too exhausted to do anything about it. A neighbour arrives and takes the newly spun yarn and knits it into a sweater. But no one will buy the sweater, not only because they are too poor but also because it cries out as if in agony. The young man, who continues his protest against the factory, has a feeling that the sweater should not be sold. Eventually, the sweater ends up in a pawnshop. The crisis is averted when the young man puts on the sweater knitted by his mother – now red with her blood. He looks and the snow and comes to the realization that he is a poet: “Look! Aren’t these beautiful snowflakes the forgotten words of the poor? . . . their dreams, spirits, desires. . . ” As he writes down these words, the snow melts, and the sun comes out. Owner-less storerooms are opened and all the people get sweaters. Visually, the film does an excellent job of representing the settings and characters of Abe’s story. 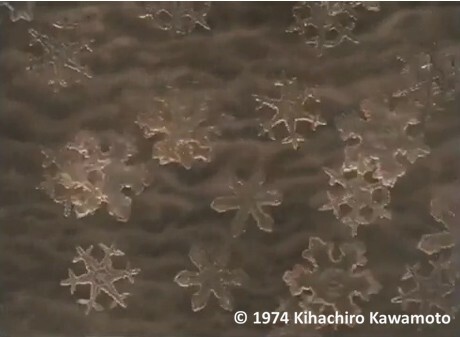 Compared to Kawamoto’s later puppet animation, however, this animation is less expressive with too much reliance on the text than on the visuals. Although the text is very poetically written, I think the film would have been a lot stronger if it had relied on the animation to tell the story. The red sweater is a particularly compelling visual motif because it is the only object that is brightly coloured in an otherwise monotone film. Two decades later, Steven Spielberg would use this same technique in his Oscar-winning film Schindler’s List (1993) with the memorable image of a girl in the red coat.